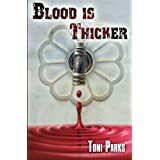 Tony writes under the pseudonym of Toni Parks, as he says, ‘To sound more trendy and attract more female readers,’ but the reality is that is has done neither. A latecomer to writing, Tony retired to The Scottish Borders two and a half years ago along with Jean his wife and Tyler his then five year old grandson. Not being part of Jean’s retirement plans but a chance meeting with a self-published author set him down the writing path. Thus armed with his GCE ‘O’ Level and supported by the amount of books he had read, he set about his first crime thriller. ‘I’ve worked in advertising all my life, although not in the creative field. But I have been around copywriters and like to think that I’ve learnt part of my craft by osmosis.’ The first book became two and now a third completes The Gemini Borders’ Trilogy. A crime thriller based in The Scottish Borders, principally featuring three characters whose lives become inextricably entwined. Blood Is Thicker (Part one of the Trilogy) Self-published on Amazon in 2013 – paperback and digital. 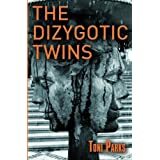 The Dizygotic Twins (Part two of the Trilogy) Self-published on Amazon in 2014 – paperback and digital. Cause & Effect (Part three of the Trilogy) To be self-published on Amazon in 2015 – paperback and digital.